Well that was a freebie. The tube barriers at High Barnet ajar for no apparent reason was a perfect way to top off that January afternoon. City had just lost 2-0 to a clumsy and uncoordinated Barnet team at Underhill; another in the list of pitiful away performances in the capital. But it didn’t really matter. Nothing really counted that day. The fans in the away end never seemed that downhearted, as if their team had just comfortably beaten the worst side in the country, not just been turned over. And this is from a set of fans who famously booed off their team in victory a few seasons before. It was just another chore to get through before the fun could start. No injuries, no suspensions and Edgar Davids in a leather jacket and skinny jeans. Of what dreams are made. Three nights later, Carl McHugh would bury that injury time header and no one would ever speak of that trip to Underhill again. These were of course the days when cup runs and league successes were mutually exclusive. Objectively, Tuesday night’s game at home to Crawley falls into this category. Again they are facing off against a significantly inferior team based on the league table, and again they sights may be set down the road. 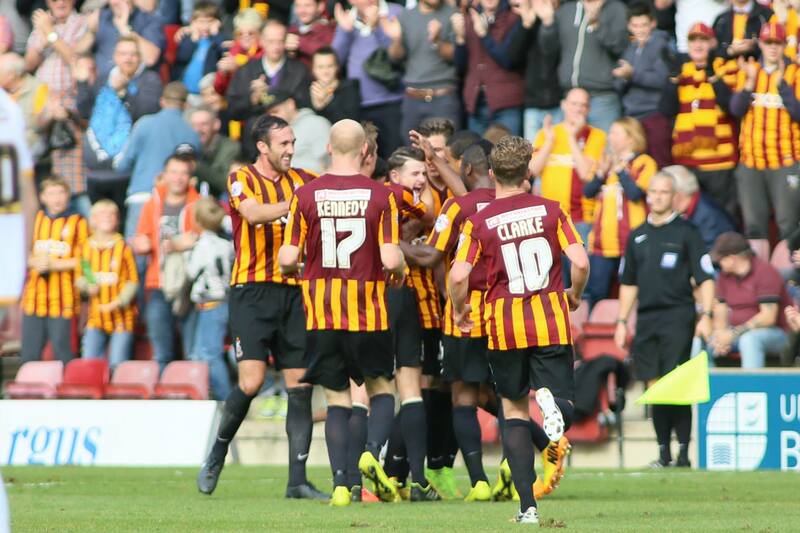 If City can win on Saturday lunchtime nobody will remember what happens at Valley Parade tonight. And rightly so, FA Cup Quarter Finals don’t come around that often for clubs in our position. From the perspective of both the owners and the fans, Saturday’s game is clearly where the focus should be. As a fan, if you’re not in this thing for big showpiece cup games, what are you here for? That said, there is a feeling around the club at the minute that City could quietly do with a win tonight. Saying the team are currently three points out of the play offs with a game in hand, and a superior goal difference – far beyond the expectations of all but the most optimistic heading into the season – and in the last eight of the FA Cup with at least a “winnable” draw, the ‘feel good factor’ isn’t exactly overpowering at the moment. The last month has seen the club and its fans stumble from one ‘outrage’ straight into the next like Sideshow Bob in a garden centre. From the club’s shambolic organisation, to the furore over the “shunning” by the BBC, to “the worst pitch in the country”, to Aaron Mclean’s Twitter feed – each outrage becoming an embarrassing parody of itself long before reaching its conclusion – you’d be forgiven for forgetting that this, right now, is as exciting a position as the club has found itself in over 15 years. Granted, no wins in three doesn’t help, in spite of the fact this run includes a close defeat away to the leaders and a textbook Valley Parade foot-shooting, and has been without at least three of the team’s best and most important players. Despite all of this mitigation, every trip on to the message boards and the Twitter feeds feels a bit daunting, to the point where I’ve wound up mostly foregoing them both in recent weeks. The biggest game in two years beckons on Saturday – probably a top five game in terms of importance over the past decade, absolutely saying more about the decade than the game – but that rising excitement doesn’t really seem to be here yet. They could do with a win tonight. If for nothing else, to just draw a line under all this grumbling amongst the fans. Under new manager Dean Saunders, Crawley have been witnessing a mini-renaissance, even if they do find themselves still in the lower reaches of the division. Former manager John Gregory spoke of revolutionising the squad ahead of the year, building a stronger, more resolute Izale McLeod-led team than the Billy Clarke-inspired tippy tapping of years gone by. That went well, with the club finding themselves bottom at Christmas. They are still only a half-decent Yeovil Town run away from being bottom of the league entering March, and the resurgence I alluded to previously only consists of 10 points from 6 games, but progress is progress! It took them 14 games to get the previous 10 points. Still, they are still the worst away team in the division, combining the worst away defence with the second worst away attack. But they just won at Swindon, so what do statistics mean, really? Quick sidebar here, I’m not sure there has ever been as definitive a “Good Bad Team” as Notts County this year. In games against the bottom half of the division: first. In games against the top half of the division: twenty-fourth. Impressively staying in their lane. How City will line up is a mystery really. I’m sure we could all name the team for Saturday with little trouble, but Parkinson could go in any number of ways tonight. The reportedly impressive Oliver Burke will likely make his home debut to afford one of his midfield comrades a breather ahead of the weekend. Given James Hanson has missed the last three games after being withdrawn at half time at Orient – after an exceptional half of football – he will likely feature in some role if he is close to fitness, to shake the rust off ahead of Saturday. Outside of this, I have little in the form of insight. Player of the Year elect Rory McArdle, and Stephen Darby will probably play. Out on a ledge there. Given all this, I would think Parkinson would be going for the win tonight first and foremost, though it should be noted that this is the fourth midweek game in a row, in the midst of a run of six straight. There is a longer game for him to play. A win tonight would send City on the cusp of the play offs, at the head of a large group of flawed, inconsistent teams battling for one play off spot. Before the season I noted that the average sixth-place team in this division over the last decade has scored 74 goals over the season, and that City would face serious trouble reaching that baseline. Extrapolating their season to date, they are set to score 59 goals, well short of the region they really need to be, although better than I anticipated. And this is the flaw; this is the thing that has held them back since January last year, and continues to do so. They just struggle to score consistently. This is likely, at least in part, down to spending around 10% of the players’ salary budget on Peterborough’s assistant manager. In spite of this, in a one-off, do-or-die game, you would back this team in most situations. They have shown again and again under this manager that they can beat any team, in any situation over a ninety minute game. Not many managers game plan better than Parkinson. However, it’s easier to mask your flaws in a single game than it is over 46. And herein lies the quandary. That actually, City might have a better chance of success this year focusing on the cup game over the league game, as weird at that sounds. As much as any team can be “a cup team”, City are it. They again and again show the ability to play far above themselves in small doses. But at the same time, if they could scramble into that 6-spot, wouldn’t you back them? This time two years ago, with 14 games to play, they were ten points out. A win tonight, and they may be only one out. And given the hordes of flawed inconsistent teams, vying for the final spot this year, it is there for the taking for whoever wants it. If people are after well-boding omens, each season under Parkinson to date has seen a dramatic improvement in the closing weeks of the season, and this has been in spite of often frantically congested fixture lists. Shout out to Nick Allamby. An FA Cup Semi-Final would probably outweigh anything we could achieve in the league from this position. I mean, it’s an FA Cup Semi-Final. But given how well they have performed historically in big games, and in the play offs, part of you must wonder if they could just get in, they have a real chance. The parallels with two years are there for all who want to see them. The other three sides, whichever three they end up being, are demonstrably better sides over a 46-game season – City are clearly flawed. But in a one-off game? Who are you scared of? Like two years ago in League Two, City are still to play most of the contenders above and around them, and like two years ago, that may not necessarily be a bad thing. Because in a succession of must-win “cup finals”, who are you scared of? Despite all the good work this year, City have still lost more games at home than they’ve won. Whilst a win tonight wouldn’t solve every problem, it would destroy that statistic, which is a start. Given the bizarrely turbulent last few weeks, a confident, palate-cleansing win does feel needed. In spite of where other focuses may lie, tonight could set City up for the Cup Quarter Finals, and the succession of future Cup Finals to come. Right now is as exciting a time to be a City fan as I can remember. Now is the time to get excited. And things are only going to get better from here on out, the business end is just around the corner. every City fan is entitled to his/her opinion. I simply don’t agree with the thrust of this article. so, everyone associated with City should be solely focussed on Saturdays game? the Crawley game is of no consequence and one about which you’re not bothered whether we win or lose. should City lose on Saturday will you still be not bothered about the result of tonight’s match? the other 3 potential play off teams are demonstrably better than us? given that we don’t yet know the other 3 teams, might I point ot that we have done the double over the disliked MK, won at Deepdale and taken a point at Ashton Gate.Even if we were to scrape into the playoffs in 4th place by the skin of our teeth history should tell you something…the “best” team rarely gets the final promotion place through the play offs. can I remind you of 1996 and 2013 when we did indeed scrape into the final place. a non City fan put it to me recently…If we were to have only one Wembley appearance this time, which would I want…a cup semi final or the play off final? Absolutely no contest, the play off final by a mile! I didn’t say FA cup final or Play off final. I said the question was posed…if we only had one wembley appearance, would it be in FA cup Semi final or Play off final? If that is the either-or on offer then I stand by my choice of play off final. I’m not sure I agree with this article either. The quarter final is exciting, the prospect of a semi-final incredibly exciting but to infer that the game on Saturday is more important than any other…no. Given our league position and given the tightness of the division I would argue that the remaining league games are far more important. Let’s enjoy the quarter final for what it is, but let’s not allow it, whatever the outcome, to detract from the bigger goal of a play off position at the end of the season.